Three participants at the 2007 Polar Bear Plunge. Photo courtesy of Flickr user Earl. Do you have a way with words? Check out the second Tongue Party, part of a social storytelling series hosted by Joseph Price and Kaitlin Jentzen. Guests work with the story prompt given to them at the beginning of the evening and use it to meet other guests and share the original stories they create. Tonight’s theme is “A Meal.” Later in the evening, featured storytellers share their own prepared stories. The Tongue Party starts tonight at 7 p.m. at The Dunes, and admission costs $10. Head over to U Street Music Hall for Red Fridays, a night of house music featuring international and local talent. 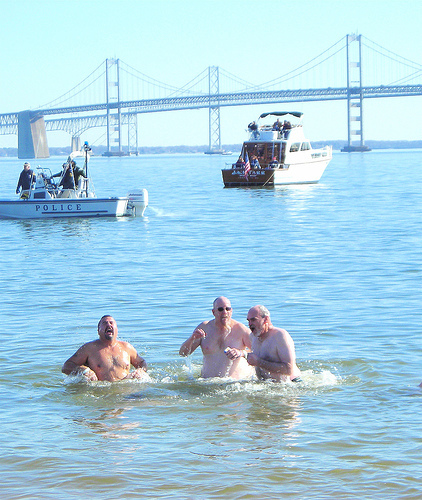 Admission is $10 beginning at 10 p.m.
Live dangerously at the 16th annual MSP Polar Bear Plunge at Sandy Point State Park in Annapolis, Md. Dive into the near-freezing waters of the Chesapeake Bay for $50 in pledges to benefit the Special Olympics Maryland.